The Dandenong Ranges are an hour’s drive east of Melbourne. The beauty and serenity has long made the region a favored destination for those wanting to escape the city. We visit William Ricketts Sanctuary, set in a superb fern forest and world renowned for its life-sized ceramic aboriginal dreamtime sculptures. William Ricketts was a sculptor who dedicated his life to a strong connection with the local environment and a deep understanding of aboriginal people. After a BBQ lunch (provided), we head into Sherbrooke Forest, home of the world’s largest flowering trees (the mountain ash) and giant soft tree ferns set in lush temperate rainforest. The area is also a habitat for the lyre bird, known for its ability to mimic other bird calls of the forest. We finish at the Mt Dandenong Observatory, by far the best view of the city of Melbourne. Phillip Island is little more than two hours drive south-east of Melbourne. Its attractions have made it one of Victoria’s leading tourist destinations. We start this day trip by driving directly to the Phillip Island Koala Conservation Centre, sanctuary to a large population of Australia's most cuddly marsupials. Our staff will be able to inform you of some of the issues involving koalas, and the ecological significance of their habitat on the island. Following lunch at one of the small townships, we then head to Cape Woolamai, for a walk along the famous surf beach and spectacular coastline. Seals and dolphins are often spotted on this walk as they swim and feed just off the headland. 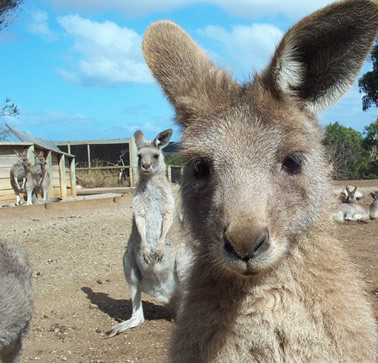 The Phillip Island Wildlife Park, is next on the agenda. The Park is home to a wide range of native animals from all over Australia, and provides the opportunity to hand feed much of the wildlife, including kangaroos, wombats, emu's, and many more. When night falls, we venture once more to the coastline to watch the Little Penguins (aka Fairy Penguins) make their ritualistic march up the beaches to settle into their nests. The number of penguins seen can vary, although it is not uncommon to see hundreds on a good night.